For John May, life is looking up. Factory Worker: [while wearing the cover] Should be the right size... Sorry about this... You know, health rules. John May: I understand... I also have to wear this stuff at work sometimes. Factory Worker: You're in food processing, too, then? Baking? John May: Baking? No. No, not really baking. I'm actually a... Well, I only have to wear this when I see people. John May: Yes. I mean people, uh... who, who don't bake anymore. This is a great film, absorbing from start to finish. 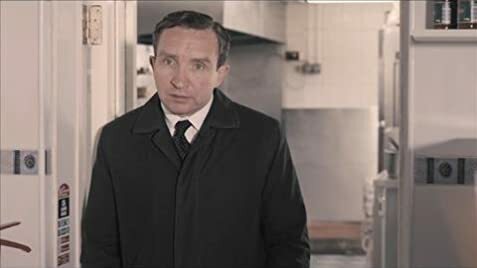 The lead actor Eddie Marsan (playing John May) is outstanding. Let me first say that this is not a comedy. It has a dark theme, loneliness and death. May works for the council and his delightful job is to track down relatives of people who have died alone. Sometimes though these people die alone for a good reason and so May is often the sole attendee at the funeral. May is so compassionate that he tries to replace the missing family and friends by writing obituaries based on what he finds at the deceased 's residence. It's really touching and sincere. May himself is also a bit of a loner. 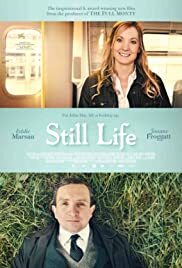 The scenes of how people live and the way they talk about each other is beautifully done and so English - fish and chip shops, the pub, the banter with old colleagues of victims. Marsan is just superb. The other characters are minor compared to him but still make excellent contributions (Jumbo makes a few serious comments about war, Mary in the chip shop helps us see a better side of a tough guy, the same guy's daughter gives us another view again). I really like the way the story develops and found the ending very satisfying and fitting. Go see it. 65 of 70 people found this review helpful. Was this review helpful to you?